More than 2 million children in Ghana and Cote d’Ivoire work in hazardous conditions growing cocoa, the main ingredient in chocolate, according to the US Department of Labor1. While some companies have begun tracing their supply chains to prevent child labor, the vast majority of the 3 million tons of cocoa produced each year come from small farms in West Africa, where farmers and their children live on less than $1 per day2. This scorecard will help you find ethically sourced sweets and understand what these labels mean. 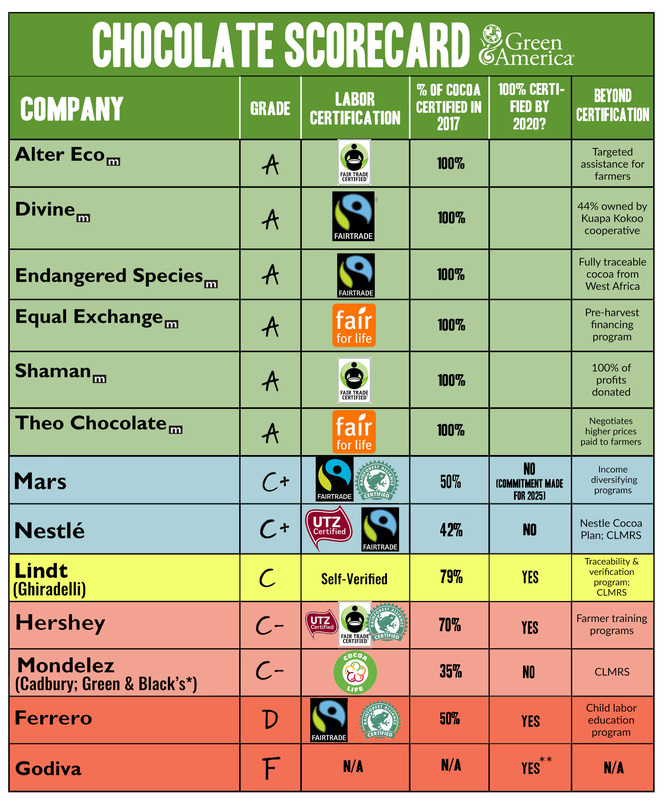 This is, of course, not a comprehensive list of ethically sourced chocolate companies; however, the scorecard features companies who are also Green Business Network members, as Green America has screened them for their practices. Chocolate bars with an "A" rating are organic and/or non-GMO certified. With that in mind, we are expanding our chocolate scorecard to go beyond commitments about certified chocolate. With this updated scorecard, we are not only looking at how much certified cocoa a major chocolate company has, we are also looking to see if the companies have innovative programs and projects in place to address some of the other underlying issues of child labor in cocoa. Although companies may have beyond certification programs that sound similar, they can vary in practice in regards to how comprehensive and impactful they are, and the final grade reflects that. You can learn more about what went into the different grades here. denotes members of Green America's Green Business Network. *Green & Blacks is one of the pioneers of providing consumers with fair trade chocolate. While it continues to have some fair trade and organic offerings, it is also moving towards sourcing chocolate using Cocoa Life, the in-house certification scheme of its parent company, Mondelez. It appears that Green & Black’s sustainability commitments are tied to Mondelez’s overall sustainability commitments, which we feel is not as strong as some of its competitors. **Godiva has committed to "100% sustainable cocoa by 2020," but has not provided information about who is certifying its cocoa, nor shared any progress or plans regarding their commitment. All figures come from publicly available company information and the Cocoa Barometer. This list is not exhaustive of all chocolate companies. If your favorite chocolate brand is not listed, consider calling the company to ask about its commitment to ethical sourcing. Fairtrade standards prohibit forced labor, child labor, and discrimination. If child labor is detected in a supply chain, Fairtrade immediately enacts its child protection policy and implements remediation efforts. Certified farmers’ organizations receive at least the Fairtrade Minimum Price for their cocoa beans and a Fairtrade Premium that they use to invest in their communities and business. To use the FAIRTRADE certification mark on a product, all ingredients that can be certified must come from Fairtrade sources. Fair Trade USA’s Fair Trade Certified standards prohibit forced labor, child labor, and discrimination, and protects freedom of association and collective bargaining rights. If child labor should surface, remediation guidelines are in place. Certified farmers are guaranteed a fair trade floor price for their cocoa beans as well as a social premium. Fair Trade Certified certifies farmer cooperatives as well as larger plantations. Only cocoa needs to be certified for the chocolate bar to receive the seal. The IMO Fair for Life guarantees that smallholder farmers receive fair payment and that workers enjoy good and fair working conditions. The Fair for Life system prevents forced and child labor and also includes detailed environmental criteria. Fair For Life certified products must use Fair Trade ingredients if available, and regardless, 50% of all ingredients must be Fair Trade in order for a product to bear the seal. RA standards prohibit the use of forced labor, child labor, and discrimination, and farmers have the right to oragnize. RA does not require buyers to pay a specific minimum floor price for cocoa beans. RA reasons that by producing higher quality and sustainable cocoa beans, farmers should be able to earn a higher price for their beans over time. UTZ certification prohibits forced labor, child labor, and discrimination and protects the right to organize and bargain collectively. In terms of pricing, UTZ states that premiums are paid to farmers for their certified products, but the price is solely based on negotiations between the buyers and farmers. Paying the legal minimum wage is required. NOTE: In 2018, Rainforest Alliance and Utz merged. In 2019, Rainforest Alliance will release its new standards. Until then, Rainforest Alliance and Utz standards will continue to be applied.